Gold Rush Crochet Thread.8x60g Balls. Metallic Colours. Gold Rush Crochet Thread 8x60g Balls. Gold. 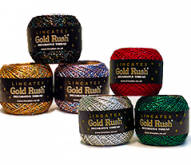 Gold Rush Crochet Thread 8x60g Balls. Silver.